Have you ever seen a deodorant commercial? It seems that every single one advertises some girl in a LBD who got deodorant marks all over herself, but alas...(insert brand here) to the rescue! No more icky white streaks on your favorite black outfit! Guess what folks...I've tried all the deodorants out there, and I've come to realize that just about every one of them that keeps my stink away will streak white all over. This is where Miss Oops comes into play! 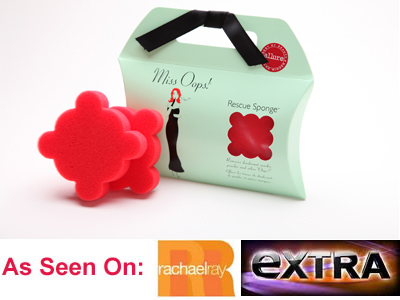 Retailing at $10 for a pack of 2, these Rescue Sponges rock. Simply rub it briskly against the offending mark and watch its disappearing act. No need for water, and these are safe on all fabrics as well as reusable. I haven't tried it on makeup stains, but these bad boys are good for that too. I can attest to the fact that these work, and work well. I have had one in my purse ever since I got them in the mail, and have my family hooked on them too. The first time I tried this, I actually swiped deodorant on my shirt on purpose just to see if I could get it off. It truly works and goes above and beyond the call of duty. Pick yourself up a Miss Oops and never again have deo-goo on your favorite outfit! This product sounds like a life saver! What a great invention. I'm normally a jeans and t-shirt kind of gal and normally don't have any issues with deodorant streaking on my shirts except on the inside where no one can see it, but this would be perfect for those rare occasions that I actually dress up!